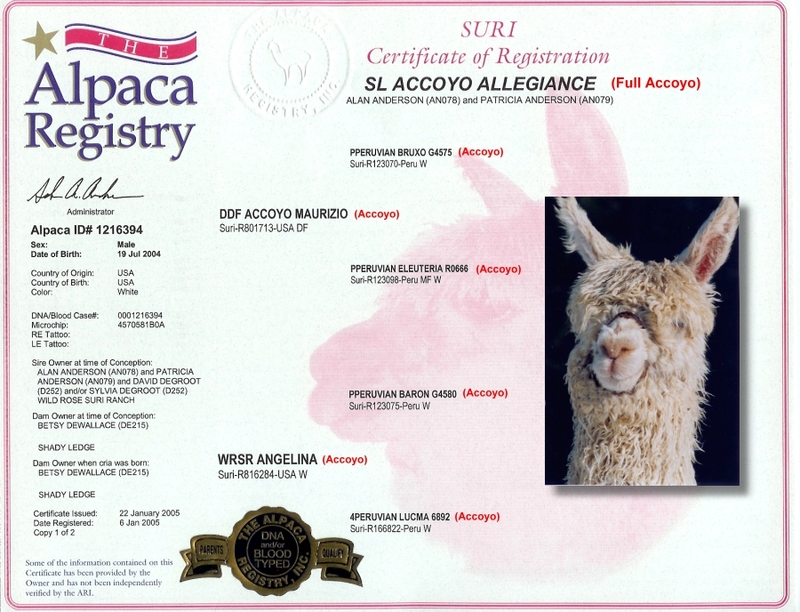 Maurizio is the full Accoyo son of 2Peruvian Bruxo (Accoyo) and 2Peruvian Eleuteria (Accoyo) who is medium fawn in color. Maurizio carries the gentle nature of his sire Bruxo, along with strong, heavy boned body type. Maurizio's fleece has narrow, high luster locks with that desirable "greasy" appearance. He has outstanding leg coverage, a heavy dense fleece, and still sports facial coverage and a beard at the age of 5. Accoyo Bruxo has produced many show-winning offspring, and there is great expectation for Maurizio producing colored Accoyos with show-winning records. He has dark, light, and multi crias on the ground, alowing color to pass through. He has produced light fawn, beige, and white colors out of solid white females. Maurizio will be available for limited breedings on the East Coast at both Wild Rose Suri Ranch and Shasta Springs Alpacas. Call now to make arrangements to be on the list for this fine stud. His cria will make a fabulous addition to your herd! Angelina is an Accoyo Baron daughter out of the dam of Accoyo Baccarat. She is a fantastic production dam - milks heavy, births easily, rebreeds quickly, and is a wonderful dam. Her crias are extremely healthy and grow rapidly. She is solid white and large weighing 180 lbs when open. WRSR Accoyo Allegiance’s Avanti won “Light Color Champion” (44 entries) at the 2011 Suri Network All Suri Fleece Show and competed against Branagan for Judges’ Choice! Luster, lock, color, and full Accoyo bloodlines! This Accoyo Herd Sire has it all. Allegiance's coveted and unique bloodlines offer you the best genetics from proven Accoyo lines. His dam, WRSR Angelina (Accoyo), is an Accoyo Baron daughter out of the dam of beige Accoyo Baccarat. While she is solid white, she carries color in her background. Allegiance's sire is medium fawn Accoyo Maurizio, and darkest full Accoyo fawn Bruxo son. Allegiance shows a spot of dark fawn color indicating his potential for color Accoyo crias. 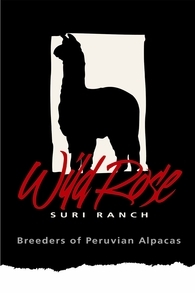 He has produced CHAMPION and JUDGE'S CHOICE crias at Wild Rose: WRSR Accoyo Allegiance's Avanti, a solid light fawn, super greasy and dense male and WRSR Branagan by Allegiance, a dark fawn super fine and uniform jr. herd sire. 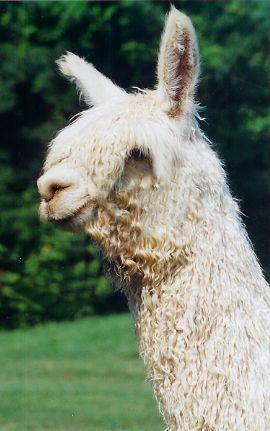 Allegiance has produced several color crias out of white dams! Allegiance is large, heavy boned, with beautiful proportions. He has straight legs, a typey Peruvian head with a small nose, and a level top line. This herd sire offers some of the most sought after production traits for breeding. He sheared 7.1 lbs at 10.8 months of age with a 7.5 inch staple length. His regrowth was phenomenally curly like a sheep with the same great coverage and beard, coming back with all the luster and density, and he sheared 11.0 lbs after 11.5 months regrowth! He has a calm temperament and is very easy to handle, a trait passed to his crias. Be sure to stop by our pens at the MAPACA Jubilee and AOBA and see his offspring "WRSR Classy Chic by Allegiance" and WRSR Accoyo Allegiance's Avanti, the 2010 & 2011 MAPACA Light Color Champion and 2010 Judge's Choice Winner! Contact Patti at 443-740-4240 to schedule your breeding now!